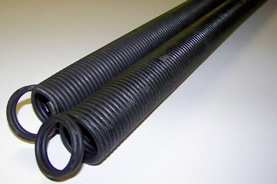 Did you notice an orange tint on your torsion or extension springs? Or perhaps you see a gap in the torsion springs. If this is the case, give us a call immediately and avoid using the garage door until one of our experts gets a chance to analyze the springs. Furthermore, if you hear a loud bang and the door stops working, don’t use force to open or close it; call us immediately! You must be aware that springs are dangerous when they snap. They can cause a lot of property damage and can break other sections of the door. In fact, it is not uncommon for broken springs to bend the upper part of the garage door. To avoid having to pay for more extensive repairs in the future, contact Sunnyvale Garage Door Services as soon as you notice something strange about your springs. We are the best garage door repair and installation company in Sunnyvale, CA and our experts are ready to come to your aid. We know how frustrating it is to have to deal with a door that gets stuck or stops working out of the blue. Upon request, we are able to offer you same day service. Remember that the garage door can allow thieves and burglars to enter your garage and then your home if it is open. A door that doesn’t close properly at night is definitely not something you want to postpone fixing. Locals in Sunnyvale, California turn to us every time something is wrong with their garage doors. They know that we are the only company that can help them quickly and effectively. Our solutions are made to last and our team is very courteous and friendly. We are professionals and your family, valuables and pets are safe around our technicians. Give us a call today and ask us more about our services and our amazing reviews. If you choose to work with us, you will never regret it! Call now! Copyright 2016 Superfast Garage Doors Sunnyvale. All rights reserved.